The University of Warsaw is a member of the European University Association (EUA) and the Network of Universities from the Capitals of Europe (UNICA). 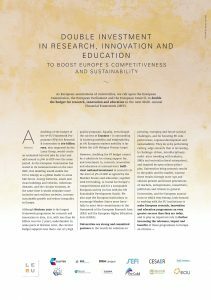 These two institutions and 10 other networks and associations have signed a joint statement calling on the European institutions, the European Commission, European Parliament and European Council, to double the budget for research, innovation and education – up to 160 billion euro – in the next Multi-Annual Financial Framework (MFF). The statement is a result of an initiative by the League of European Research Universities (LERU) and follows three consultation rounds.The Universty of Warsaw actively participated in the preparation of the document. The statement was signed by CESAER, CLUSTER, Coimbra Group, EARMA, EASSH, ECIU, EUA, The Guild, IDEA League, LERU, SEFI, UNICA, YERUN.